Input checkbox must be placed just before the box. Label can be placed where you want. Then you must use css trick with “+” selector. 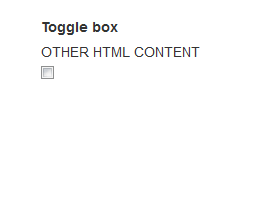 Label with attribute “for” checks/unchecks input checkbox, and below css rule switch visibility of box. 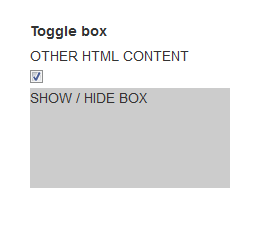 hide input checkbox by display: none. Of course, at the end you should hide input checkbox by display: none; in CSS.